it’s a new take on the old KISS principle: a simple message that conveys the sentiment most associated with Old Pasadena – the feeling of community and family that is the cornerstone of its appeal. The four words we chose, “Home For The Holidays,” epitomize that unique feeling. Old Pasadena is a place where families, friends and visitors can all feel at home. The homespun craft paper design establishes that core message of community and helps drive it home. The design separates Old Pasadena from the multitude of malls that surround our little 22 blocks of town from Paseo Pasadena just up the street, to Glendale’s, Arcadia’s and of course neighboring Los Angeles. The central “Home For The Holidays” theme serves as the name of our initial kick-off celebration on November 29th, and carries on to represent merchants who go out of their way to make our visitors, shoppers and their families feel at home. Naturally one of the advantages of the craft paper design is it’s clarity of communication. 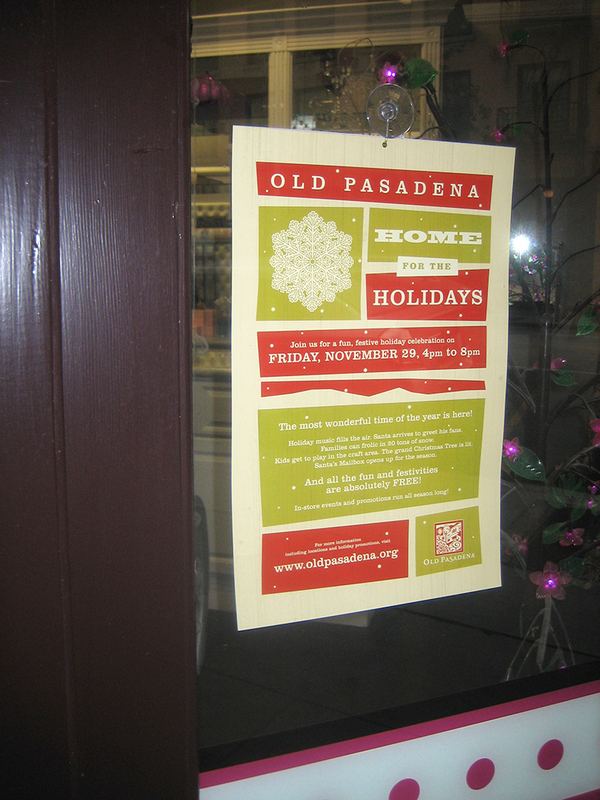 You can not miss “Old Pasadena” or “Home For The Holidays” or “Friday, November 29, 4 pm to 8 pm.” It works at any size from the 40-inch wide back-lit signs in our parking structures to the 11 by 17 posters displayed in shop windows around town and even the 5 by 7 postcard size handouts on cash register counters around town. 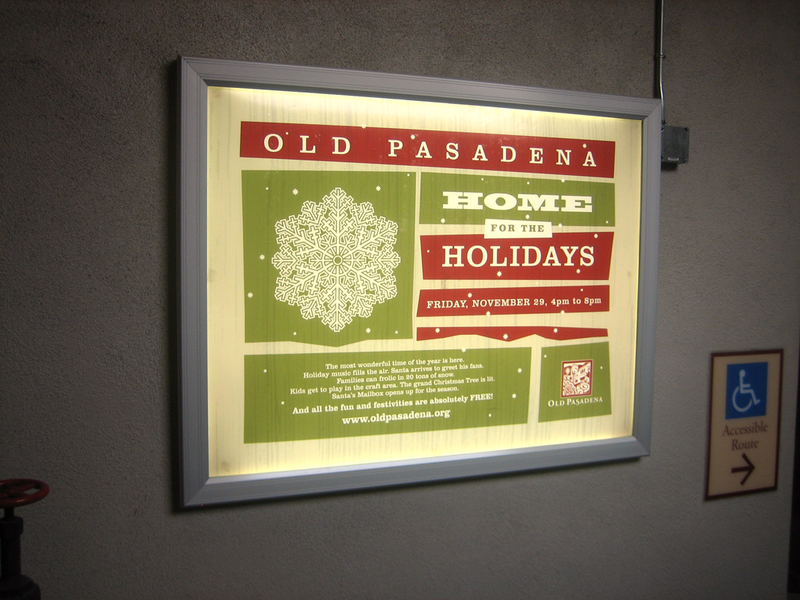 PADV is proud to have been chosen to design and produce this campaign for Old Pasadena, and we invite you and your family to come be a part of our Annual Holiday festivities starting with the snow on Holly Street and Santa visiting One Colorado for the tree lighting. Then come back to discover what’s in store throughout all 22 blocks of Old Pasadena.